Hey this is my favorite Theme. Thanks Klaartje wonderful. Here is my arch. Thanks for looking. gosh what a challenge…. i used ‘trash’ to make my background rather than adding any elements…. used stale bread, yoghurt pot, used tea bag and an old net for putting washing tablets into. Great idea! here’s my arch! Great challenge Klaartje! here is mine. Thank you, this was fun! I will be back to look at all the arches during the week! This is a terrific theme! Here’s my arch. This is my entry Using trash ! My entry for this week, using trash on Gothic Arches. 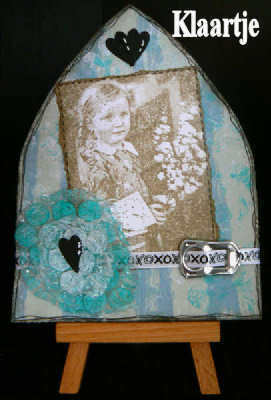 What a fun theme, Klaartje! Here is my collage of trash! i’m very happy with this theme!! thank you!!! Great fun!!! I have lots of trash in my studio, so this was a no brainer. Here’s mine! I don’t have a lot of room to keep a lot of trash, it usually goes out immediately, but I found this. Great challenge. I loved this challenge so much I did 2!!! Hi, I just stumbled across your great site and was wondering if anybody can join in ? Looks like fun! and you don’t have to read the long post unless you want to. Yes, anyone can join in! Come on in and have a go – you will become addicted like me! I have been wanting to do the weekly challenges for awhile,now that I have a blog I thought I would try to start with this one. I have been wanting to do the gothic arch challenges for awhile,and now that I have a blog I thought I would start with this weeks arch of using Trash. My arches are posted – I missed last week with an incrediable cold. It is good to feel better once again. I moved to a new blog just for a refreshing change with the coming of spring. Spring comes very late to Upstate, New York and I miss the warmth of the sun !!! My “Using Trash” gothic arch-thank you! j’espère qu’il est encore temps ! voici mon arche pour cette semaine ! je me suis régalée avec cette idée tellement originale ! Here is my Trash Art, at the very last minute!